TwitterBerry v.0.8 - What are you doing (on your Berry)? 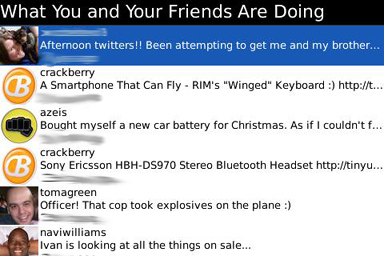 Lately, I've been getting more and more into the social side of BlackBerry life. Sure, CrackBerry.com has allowed me to find friends who share the same addiction, but I do like to take a peek at other sites as well. I was a slow adoptee of FaceBook and now I continue to grow my social network with sites like Twitter. For those who aren't familiar with Twitter, it lets you connect and communicate with others using, what they call, one question; "What are you doing?" You are able to use your Berry to keep up with Twitter and its Tweets through SMS. To make accessing Twitter easier, Orangatame Software offers a free beta application called TwitterBerry. Instead of using SMS, you can use data to maintain your social butterfly ways. So, whether you are sending direct messages, replying to tweets and direct message or updating timelines, TwitterBerry should keep you from being bogged down by your online social life. Are you new to the world of Twitter? Check out Twitter.com and get familiar with its ins and outs. That way, some of the terminology will make more sense, and I will (hopefully) sound less weird. TwitterBerry can be used by ALL of the newest and shiniest Berrys (including the Storm), as well as the more seasoned models including the 71xx, 72xx and 75xx series. Once downloaded, you can access TwitterBerry from the stylized Twitter "t" icon. When you open TwitterBerry, you are greeted by Twitters famous yet simple question; What are you doing? There are 140 characters available to you so you can keep those in the know, updated. The newest version of TwitterBerry is supposed to allow for character overflow when typing a tweet. When I'm ready to send off my tweet, I click Update. TwitterBerry will then notify me of the update completion by displaying a popup saying "success". Success indeed! I logged into my account on my computer and found my words of wisdom displayed for my friends to see. You are also able to send pictures, called TwitPics, with TwitterBerry. what do you mean "What am I doing"?! To send pictures from your Berry, you will need to navigate to your native media section. Open up a pic you wish to send (perhaps a pic of you receiving a new BlackBerry for Christmas). Press the menu button and select "Send to TwitterBerry." You are then redirected to TwitterBerry. Have a look at the bottom, your available characters have dropped from 140 to 116. This is because the TwitPic URL is 24 characters long and is pre-pended to your tweet. Friends Timeline - Check out all of the tweets you and your friends have posted. Very similar to the Twitter site, you can see their avatars, name, message and the time the tweet was created. Highlight a tweet and you can send them a direct message, reply or add as a favourite. Public Timeline - all of the viewing goodness of the Friends Timeline, with access to the Twitter community. Highlighting a tweet will give you the option to follow the member. My Timeline - have a look at what you've been babbling about by viewing your own tweets, replies and direct messages. My Friends - view your friends and their basic details. 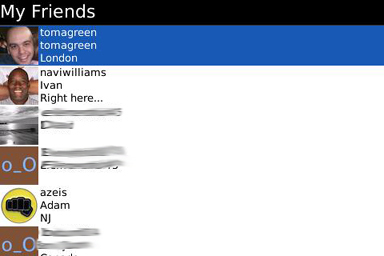 Within this section you can also send messages and replies. TwitterBerry can also let you view their timeline. 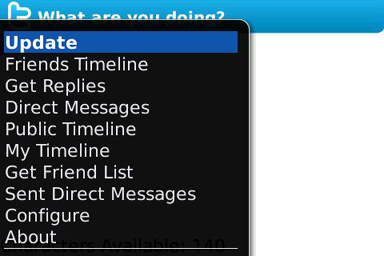 Using TwitterBerry is a snap, as it gives you access to the basic, quick features of Twitter. I rarely access Twitter on my computer, maybe to update my avatar or change my colour scheme. With the newest version of TwitterBerry, you can now cache up to 200 tweets from Friends Timeline, Replies Timeline and direct messages. Another new feature for TwitterBerry, is the message notification. Jump over to your Profiles. When you choose to edit, you will see that you can now assign notifications for Direct Messages, Friends Timelines and Replies. 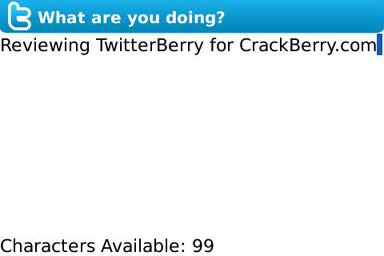 If you're looking for a way feed your addiction to both Twitter and your BlackBerry, TwitterBerry is your best bet. TwitterBerry is direct and to the point when it comes to letting people know what you are doing and what others are doing too. 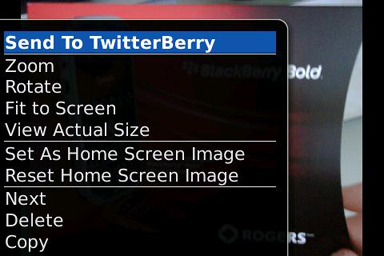 You can manage almost anything Twitter related, right from your Berry. Make sure you clear your Twitter cache, as I've found that I had duplicate messages appearing (in my replies anyway). TwitterBerry keeps me mobile and keeps everyone in my friends list (including me) up to date. The only problem is now dealing with two addictions; BlackBerry and Twitter. You can pick up the book CRACKBERRY: True Tales of BlackBerry Use and Abuse to help with the BlackBerry addiction, perhaps Twitter or Orangatame should offer their own. For more information on the FREE application TwitterBerry, click here.